Savanna habitat near Lake Elementaita, Nakuru, Kenya. December 2015. 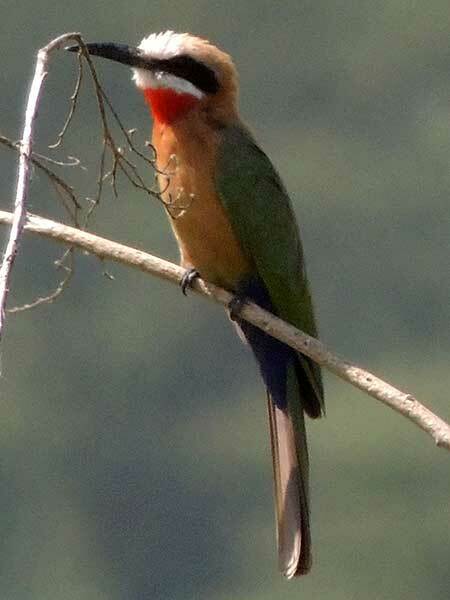 From Wikipedia: This bee-eater has a distinctive white forehead, a square tail and a bright red patch on the throat. They nest in small colonies, digging holes in cliffs or earthen banks but can usually be seen in low trees waiting for passing insects from which they hunt either by making quick hawking flights or gliding down before hovering briefly to catch insects. Copyright Michael J. Plagens, page created 25 Feb. 2016.